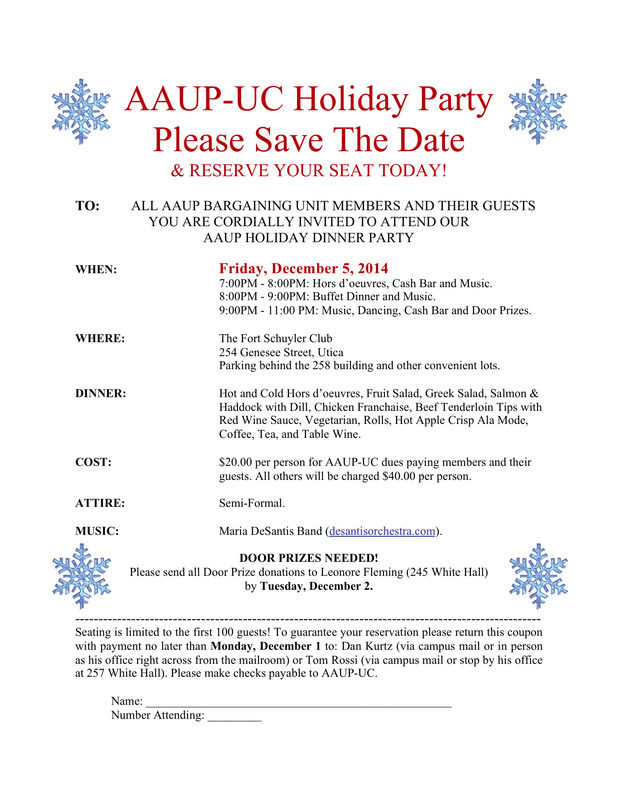 Don’t miss the AAUP-UC Holiday Party! Reserve your spot before the end of today, Monday, December 1! Deadline extended to 12pm on Thursday, December 4th! Live music provided by Maria DeSantis Band (AFM Local 78). Seating is limited to the first 100 guests! To guarantee your spot, please make your reservation with your payment no later than Monday, December 1. Deadline extended to 12pm on Thursday, December 4th! You may make your reservation with either Dan Kurtz (via campus mail, or in person at his office right across from the mailroom) or Tom Rossi (via campus mail – Box 199, or stop by his office at 257 White Hall). Please make checks payable to AAUP-UC. If you plan on donating a door prize, please contact Leonore Fleming or drop by her office (245 White Hall) no later than December 2nd.